Committee of Human Rights Reporters: Erfan Ehsani, an Iranian Bahai from Sangsar, Semnan province, was arrested yesterday and sent to the Semnan Central Prison to serve his term. Erfan Sabeti was arrested by intelligence officers while he was still waiting to hear from the Court of Appeal. His first arrest was in February 2012 .He was then released on a $50,000 bail. He had been earlier summoned by Semnan’s Intelligence Office. Later, Semnan`s Revolutionary Court sentenced him to one year imprisonment for his roles in anti-regime activities. 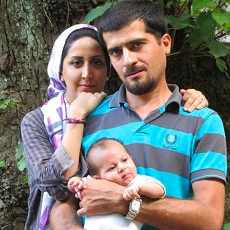 It is noteworthy that his wife Mrs Taraneh Torabi is already in Semnan’s women`s prison with her child, serving her 20-month jail sentence solely for her religious affiliations. steadfastness, perseverance and courage for the rest of Iranians. Nothing will shake the resolve of the Bahai'i's of Iran. With the hope that one day soon they will have the opportunity to live free in the land of their forefathers. being bullied by the tyrannical, thieving, corrupt islamic authorities of Iran. It just surprises me so much when I see Obama and his love for keeping his mentors IRI in power on the one hand and then Romney, the UK, France, on all sides wanting to keep the IRI as well. Then as far as they can fool their own people they lecture the world on human rights and democracy not to deliver it, but to create instability and dominate other countries and cause them to regress. If you are a Russian or Chinese person viewing this blog, while democracy is very good, don't kid yoursleves that the West wants this for you, they are pure imperialists for over 300 years with out a single change in ideology. Fortunately we have our Inspirational Shah-han-shahi and Culture, so our capability for creating a better democracy than the USA or West is there. Bahais are not POLITICAL prisoners. These people are RELIGOUS prisoners. They have been law abiding citizens for the past 34 years and have not opposed the regime in any manner. Please don't mix the 2. Support Sabeti and Torabi NOW! Don't wait for "Regime Change!" to come to free them from their prison cell. Keep in mind that all these political prisoners inside Iran also oppose sanctions, and war. serious concern about the health and well being of Mr.Erfan Sabeti and his wife Mrs.Mrs Taraneh Torabi. This young couple are unjustly incarcerated only because of their religious affiliation. organize, assemble and freedom of religion, association and expression. An injury to one, is an injury to all. Regime change by Iranians for Iranians with logistical help from the sane world is the only way to end 34 years of unmitigated human rights violations by the Messianic Islamist Rapists, “reformers” and all.